16 November 2015 – Washington, DC – The Bahraini government has only fully implemented two, and has not made any progress on eight of the 26 recommendations made by the Bahrain Independent Commission of Inquiry (BICI) in 2011, finds a new report released today by Americans for Democracy & Human Rights in Bahrain (ADHRB), the Bahrain Institute for Rights and Democracy (BIRD), and the Bahrain Center for Human Rights (BCHR). In Shattering the Façade: A Report on Bahrain’s Implementation of the BICI Recommendations Four Years On, ADHRB, BIRD, and BCHR provide recommendation-by-recommendation analysis of the Government of Bahrain’s implementation of the recommendations made by the BICI in 2011. Despite government rhetoric to the contrary, the report finds that some of the most fundamental abuses addressed by the BICI continue unabated in Bahrain. Despite the government’s claim that it has fully implemented 19, partially implemented six, and one recommendation remains inapplicable, Shattering the Façade finds that the government has fully implemented only two of the BICI’s recommendations, with 16 remaining partially implemented and eight having not been implemented at all. The eight recommendations the government has not implemented represent some of the BICI’s most vital components, including recommendations to decriminalize free speech and relax censorship, integrate government security forces and implement extensive human rights training to end human rights abuses, avoid arbitrary and incommunicado detentions, and undertake measures to prevent incitement to sectarianism. Instead, the government has specifically acted to undermine many of these recommendations, undertaking a mass campaign of arbitrary detention to silence dissent, criminalizing free speech and assembly in public and private forums, and holding security forces largely unaccountable for the torture and excessive force that continues to this day. The Bahraini government’s piecemeal approach to reform is partially due to a lack of consistent international pressure. Despite Bahrain’s backsliding on reform, the international community only voices its concern over Bahrain’s lack of progress from time to time, insisting that Bahrain must be recognized and rewarded for the steps that it has taken towards reform and reconciliation. However, this report shows that rhetoric from Bahrain’s international allies has made little impact towards pushing Manama to make meaningful progress on reform and reconciliation. Four years on, as the government continues to claim that the BICI’s recommendations are no longer relevant, it is even more critical that international allies concerned with Bahrain’s long-term stability and security, particularly the US and UK, push for reform in action. Without the Government of Bahrain’s full commitment to transparently implementing the BICI recommendations, holding security forces and government officials accountable for ongoing human rights abuses, releasing political prisoners, and engaging in a meaningful dialogue with the entire opposition, Bahrain’s persistent unrest will continue and the hope created by the BICI in 2011 may be lost. Bahrain is a small island kingdom in the Arab Gulf. In 2011, the government violently suppressed a peaceful protest movement calling for democracy and human rights. Since then, Bahraini authorities have committed increasingly severe human rights violations, including arbitrary detention, enforced disappearance, and systemic torture. Read more here. 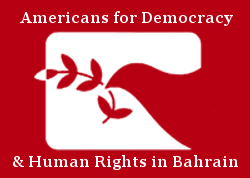 Americans for Democracy & Human Rights in Bahrain (ADHRB) fosters awareness of and support for democracy and human rights in Bahrain and the Middle East. ADHRB is always hiring both paid fellows and unpaid interns on a rolling basis. Click here for more information!